Geoff Nicholls is a musician and keyboardist, who is best known as the longtime sideman for the heavy metal band Black Sabbath. Nicholls also played in the NWOBHM band Quartz before joining Black Sabbath. He was born on 28 February 1948 in Birmingham, England. Nicholls was originally brought in as a second guitarist when Black Sabbath doubted whether they would even continue under that name. Nicholls then switched to bass when Geezer Butler left briefly, and then became the band's keyboardist upon Butler's return and the decision to keep the Sabbath name. Nicholls' first appearance on a Black Sabbath album was on 1980's Heaven And Hell, and he has been credited as keyboardist on every Sabbath release since that time, although he was not an official member until 1986. He remained an official member until 1991, then regained member status from 1993 to 1996. He was an unofficial member once again since the reunion with Ozzy Osbourne in 1997. Although his main role with Sabbath has been on the keyboard Nicholls also played some rhythm guitar on the reunion tours, eg during Iommi's solo in "Snowblind" and a few tracks during the Headless Cross and Forbidden tours. In addition to not always being credited as a full member of the band, Nicholls has rarely appeared on stage proper during Sabbath shows, instead usually playing from a side-stage or backstage position. One exception to this was the tour in support of the 1986 album Seventh Star, an album he wrote a number of lyrics to (though uncredited), where he played on stage as an equal member of the band. Another is a concert in May 1988, where Nicholls played bass for a charity function. 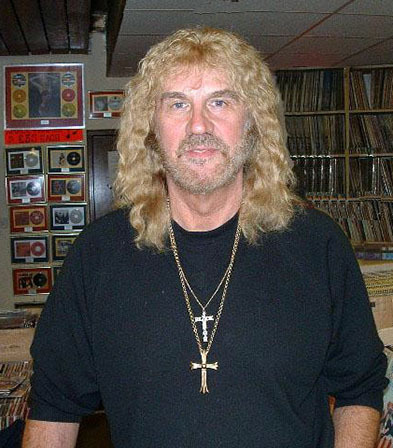 Geoff Nicholls has also had an (uncredited) hand in writing many Black Sabbath songs since his involvement in the band, including a large portion of the Seventh Star and Tyr albums, and the famous bassline for the song "Heaven and Hell". He is credited with extending Sabbath's longstanding use of the temperamental Mellotron alive into the 1980s. This long association with the band coupled with relative anonymity outside the band's followers has earned Nicholls a certain cult status with some fans, not least as he has always taken time to chat. For reasons unspecified, Nicholls' involvement with the band is currently on hiatus at best, as Adam Wakeman (a member of Ozzy Osbourne's solo band and son of Rick Wakeman from Yes) was chosen to play keyboards during Sabbath's 2004 and 2005 tours as part of Ozzfest and Scott Warren (Dio) handled keyboard duties on the 2007 Heaven and Hell trek. (As was generally the case with Nicholls, neither Warren nor Wakeman appeared onstage). Heaven and Hell features Tony Iommi, Geezer Butler, Ronnie James Dio and Vinny Appice: Nicholls had been the keyboard player on the previous two occasions this line-up has toured, in 1980-82 and 1992. Nicholls is currently playing keyboards with former Black Sabbath singer Tony Martin.